In December 1943, Lieutenant-General A.G.L. McNaughton resigned from command of the 1st Canadian Army amidst criticism of his poor generalship and of his abrasive personality. 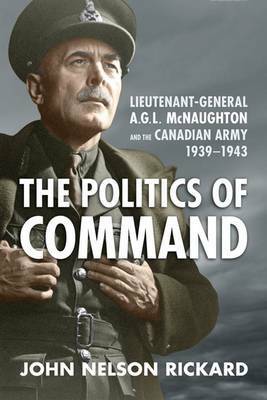 Despite McNaughton's importance to the Canadian Army during the first four years of the Second World War, little has been written about the man himself or the circumstances of his resignation. In The Politics of Command, the first full-length study of the subject since 1969, John Nelson Rickard analyzes McNaughton's performance during exercise SPARTAN in March 1943 and assesses his relationships with key figures such as Sir Alan F. Brooke, Bernard Paget, and Harry Crerar. This detailed re-examination of McNaughton's command argues that the long-accepted reasons for his relief of duty require extensive modification. Based on a wide range of sources, The Politics of Command will redefine how military historians and all Canadians look not only at "Andy" McNaughton, but the Canadian Army as well. John Nelson Rickard is a Captain in the Canadian Armed Forces and has a PhD in military history from the University of New Brunswick.